Remove the outer skin of each banana . Put the bananas in to turmeric water for 15 minutes. Then take out the bananas and scrub the outer side and wash in cool water to remove the stickiness .. Wipe them with a clean cloth and keep aside .. In between dissolve salt into 1/4 cup of water and keep it aside..
Heat the coconut oil in high flame .. When done slice each banana using a slicer directly into the oil . Make sure that all the pieces are even . Put one or two bananas with out overcrowding. Stir occasionally to flip them and keep them from sticking .. In the beginning u can see some bubbles coming ..
Lower the flame when the bubbles completely disappears. When these chips turns little crunchy increase the flame and add 1 tsp of salt water in to the oil and stir well by standing bit far away !!!.. 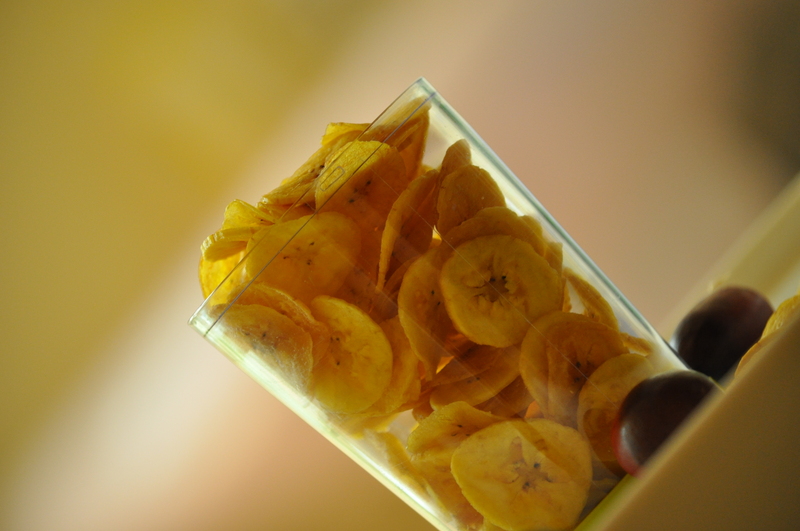 After 2 minutes or until it becomes golden yellow colour sieve them out and keep it in a flat plate lined with kitchen tissue to absorb the excess oil..
After some time transfer the yummy chips to a tight container ..
Do the same procedure with the rest of the bananas except the change in the amount of salt water ..
After first trip reduce the amount of salt water to 1/4 tsp as salt is already present in the oil.. 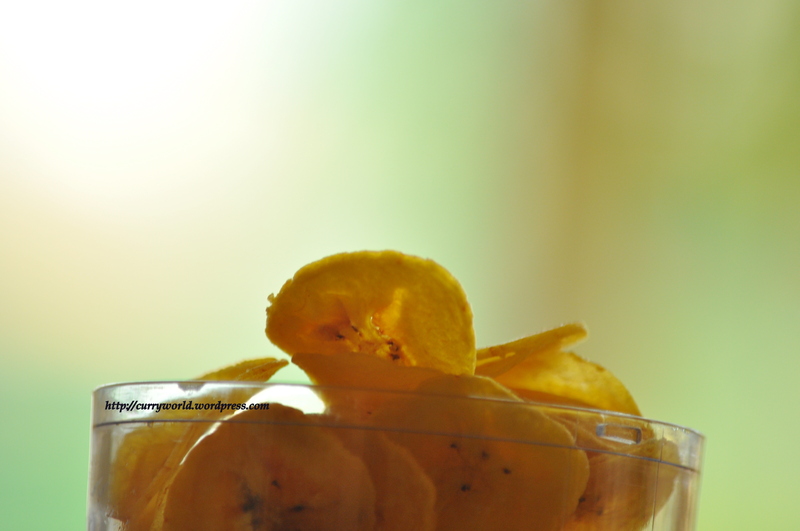 So enjoy ur sadya with this tasty home made chips ..
Could you tell me which type of raw banana should be used? The raw plantain that we get a store should suffice i guess. 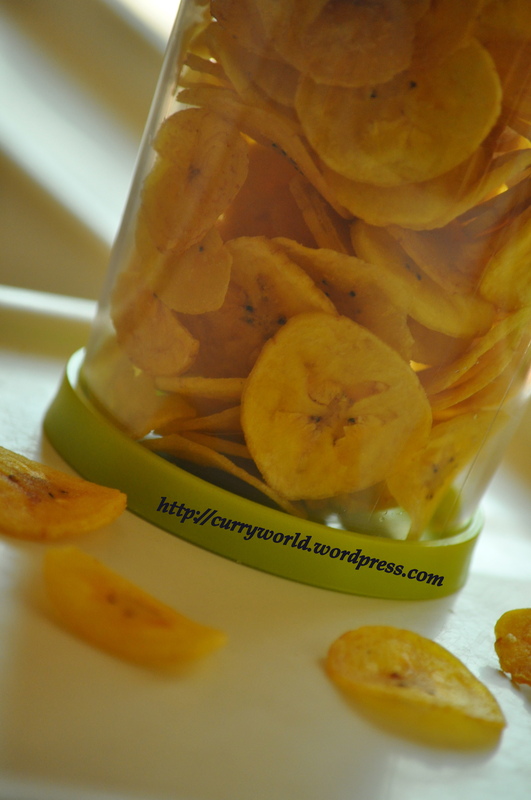 Nice and crispy banana chips…don’t get the ethaka here but will surely try them at the earliest possible. So tempting!! Welcome back after the long break..looking forward to your other delicious recipes. why using salt water !!!! Actually this is not related to the receipe but I have a query to the preparations of the festival. I am a North Indian married to a tam-malyalee and we do not stay with his family and I wanted to make the preperations for the festival. I was just wondering if there is any place in Bangalore where we can get the preparations on a plate. You know like how wen we go to temples we have a prepared ‘thali’ available, do we get something like that for vishu as well? coz i was going thro the list of requirements and i actually am not familiar with the stuff infact i dont even know what half the stuff is. If there is a particular place i can go and buy this that you know of it will be great.